Yes, the Fed credited the commercial bank accounts of the 22 primary dealers with $3 trillion in deposits when the Fed bought $3 trillion in T-bonds from the primary dealers. This is the source of the increase in reserves, as can be verified at NY Fed website. But there was another step in this process: the primary dealers bought $3 trillion in Treasuries from their clients or others in the private sector--essentially using $3 trillion of freshly minted Fed cash. 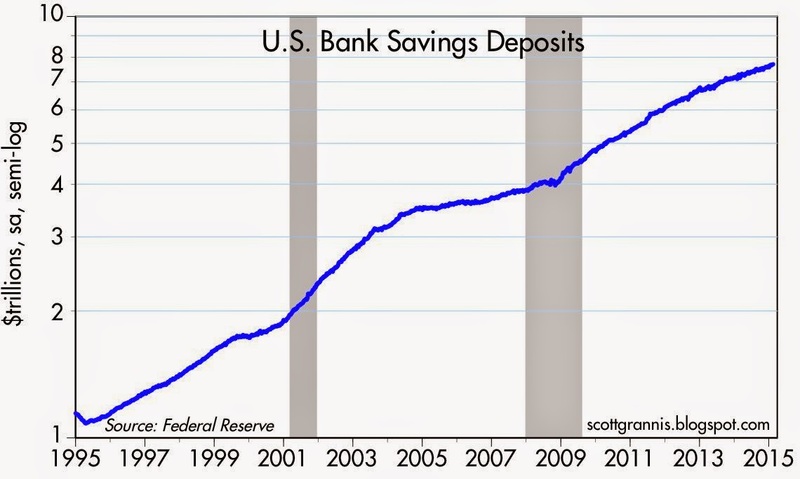 We see commercial bank deposits are weak. The bond sellers probably re-invested their proceeds in other assets, or spent the fresh cash. Pre-QE, the Fed attempted stimulus by increasing bank reserves, given that banks would usually lend out based upon their reserves. 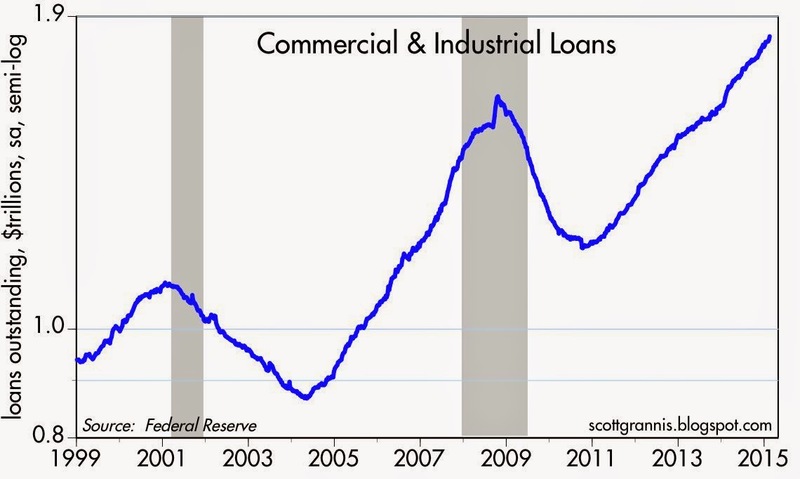 That no longer worked in 2008 as banks were not lending out to anybody. Before QE, Fed open market operations were in the billions or tens of billions of dollars. In QE, we see Fed open market operations move into the trillions of dollars, and all in one direction---buying. That is because the Fed was no longer raising bank reserves to obtain stimulus, but rather injecting trillions of dollars into the pockets of people who sold bonds. When you think about it, the futures market is saying the Fed will be tight, and possibly drive rates back down to zero. And the Fed says rates will go higher...as they want to make rates go higher, which of course will ultimately lead back to zero, as a central bank cannot tighten it way to higher interest rates for long. Tight money leads back to zero, as noted by Milton Friedman. BTW, the (headline) PCE price index out, it was 0.2% up for last year. Have to say, the Japan scenario is very possible here. The U.S. is not Japan, so our future does not have to play out exactly the same. But we could see interest rates near zero for a long, long time, and sloggy growth. Standard and Poors with 95% reporting for 2014 have the 500 GAAP earnings $102.77, and projects 2015 $111.27, and 2016 $124.20. That makes increases over the previous year of 2.6%, 8.3%, and 11.6% respectively. With the S&P 500 at 2100 that gives a PE of 20.4 now, 18.8, and 16.9 in the future. So the market is cheap. Right? I mean if earnings in 2016 are at a present PE of 16.9 why wouldn’t one just buy and hold and just go away and wait for 2016? I guess people might be skeptical of the projections. They might think Standard and Poors falls somewhere between being nice guys that could be a bit over optimistic and wall street hacks. If earnings grow 5% in 2015 and 5% in 2016 the earnings are $107.91 and $113.30 giving PEs of 19.5 and 18.5 at a price of 2100. Which means stocks are priced at about earnings growth of a bit less than 5%. 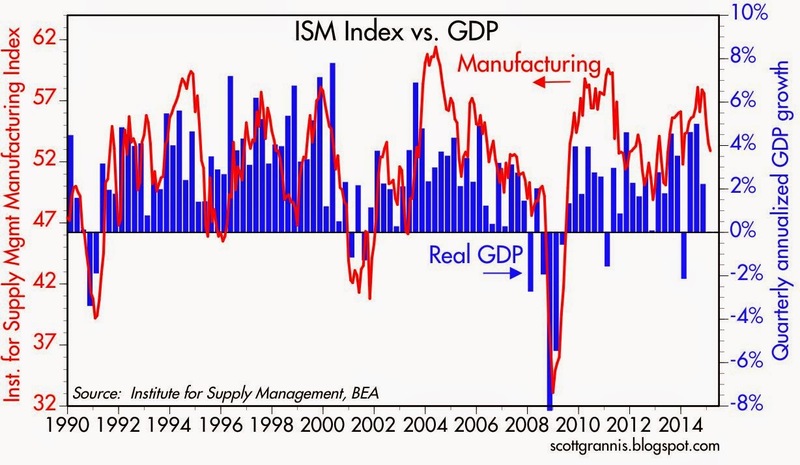 That shouldn’t be so hard with growth in productivity, buybacks, M&A, a stable or declining dollar, a recovering price of oil. And there is always QE. Trouble is, I just made a scenario for S&P 500 at 2100 over the next year if earnings only grow at 5% over the next two year each. 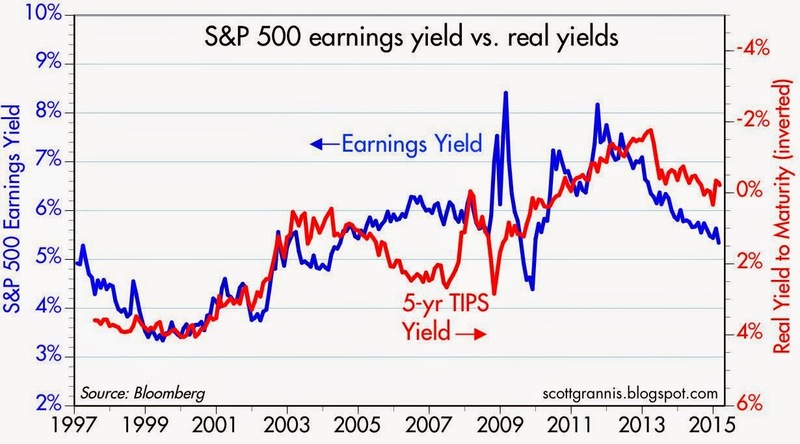 It all depends on earnings growth. A high growth in earnings will engender a high PE. And vice versa. Just sayin’ 5% earnings growth isn’t so good with prices this high. That 8.3% projected growth is important to achieve. Or at least the expectations of it being achieved is important. See, Mr. Grannis is right. This is a perfect example of being risk adverse. 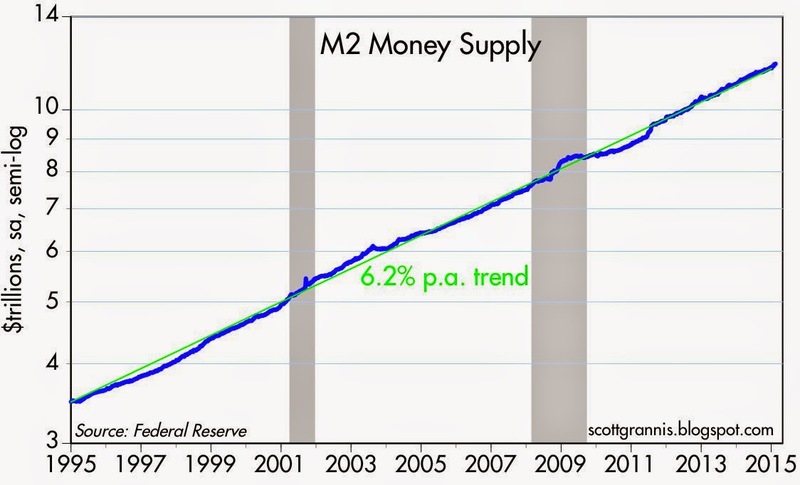 I prefer to use the more broad MZM measurement of money supply than the less broad M2 measurement. 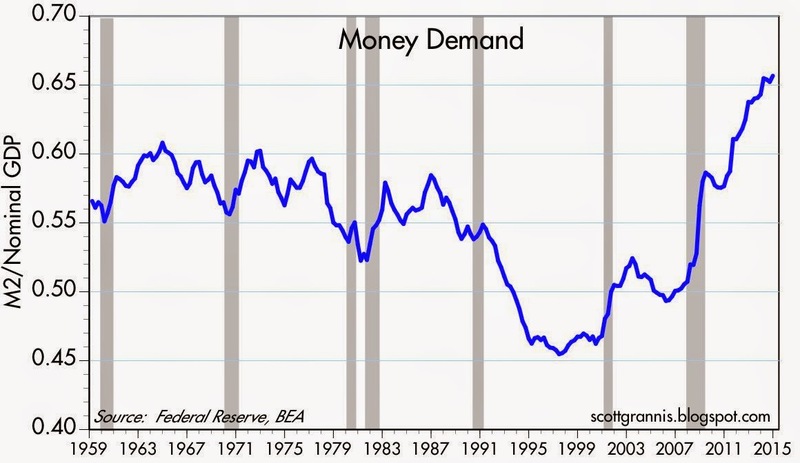 When doing so money velocity is a steadily declining trend since the great expansion since 1980. Such a trend makes sense to me with the ever decreasing federal funds rate over the same period. You never heard of credit velocity. I made it up. It already has bottomed out and is slightly increasing. Go to FRED, chart GDP and divide it by TCMDO – total credit market debt outstanding. This is perhaps most encouraging. Yes, I wonder if earnings of US corporations can rise by 20% in next two years. Earnings are now, of course, at all-time records, and far far above 1980s and 1990s levels, by any metric. Corporate America has never had it so good---and I think that is great. Bring on more profits, I say. But...I wonder how? These guys (corporate managers) are batting .400 right now. They can bat .435? 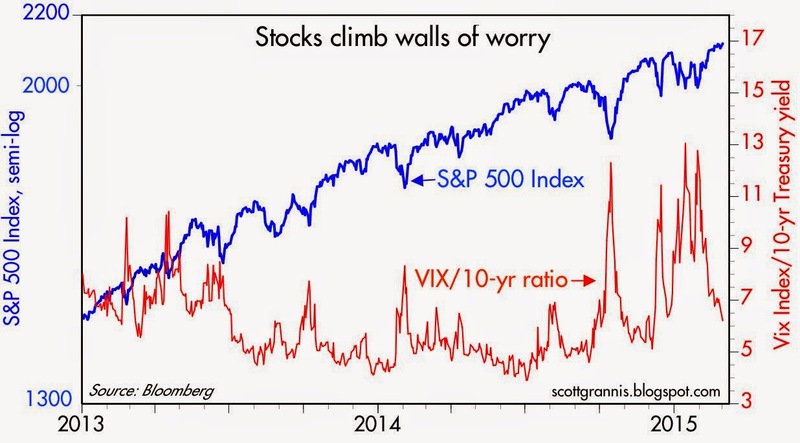 always bet with the MARKETS-especially over feds opinion of where rates will be. their track record, dismal speaks for itself. OT: the Federal Reserve says that has a balance sheet of $4.5 trillion dollars, and says it has purchased $4 trillion in securities. Commercial banks say they have excess reserves of 2.5 trillion. 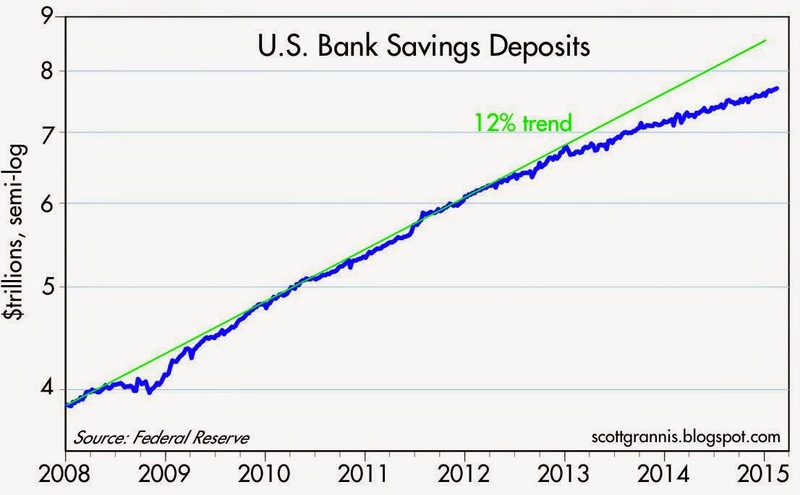 If QE equals excess reserves, what happened to the $1.5 trillion to $2 trillion? The non-excess reserves can be found in required reserves and as collateral for currency in circulation, currently about $1.3 trillion. A dollar of bank reserves can be exchanged for a dollar of currency. Required reserves are tiny; $80 bil or so. Cash in circulation is a fascinating topic. There is about $4000 in cash in circulation for every US resident. If cash in circulation has truly increased by a trillion dollars since QE, then I suggest it is very stimulative on our cash economy. I'll check the numbers later---something does not add up. The math does not jive. Currency in circulation has increased by a little less than $500 billion since late 2008. Required reserves are about $160 billion. Trust me, the numbers add up. Well, maybe I am missing something. I see the Fed buying $4 trillion in bonds since 2008. I see bank reserves now at $2.5 trillion. I see required reserves at about $77 billion, I don't know why we mismatch on that number. Cash in circulation is up $500 billion since 2008, now at $1.34 trillion. Still about $1 trillion in QE did not become reserves or cash. Add on: $500 billion in added cash in circulation must be stimulative. Sure, some of the $500 billion it is inert mattress-suitcase money, but not all of it. Well, $2.5 trillion in reserves and $500 billion in cash adds to $3 trillion; the Fed bought $4 trillion. Ergo, people who sold bonds to the Fed did not bank all of it. You had a $1 trillion in stimulus; I would say $1.5 trillion, as $500 billion in circulating cash is something. I'm trying to align the p/e chart that Blodget presents here, with your version, in the first graph of this post. Any help appreciated. My chart is fundamentally different from Blodget's chart, so the two will never align. 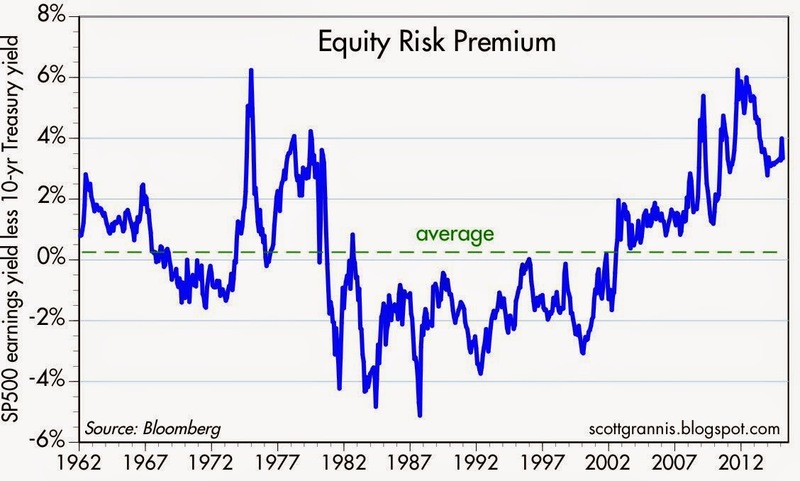 My chart is based on the standard P/E ratio: price divided by the last 12 months' worth of earnings. 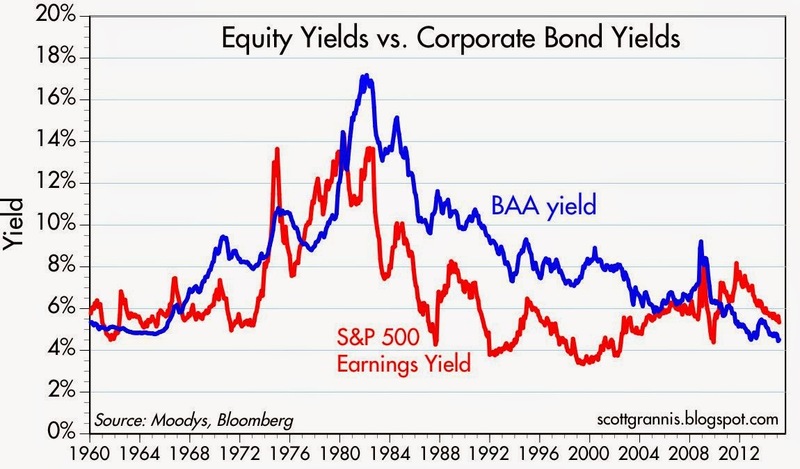 I use Bloomberg's calculation of this ratio, and Bloomberg in turn uses "adjusted" earnings. 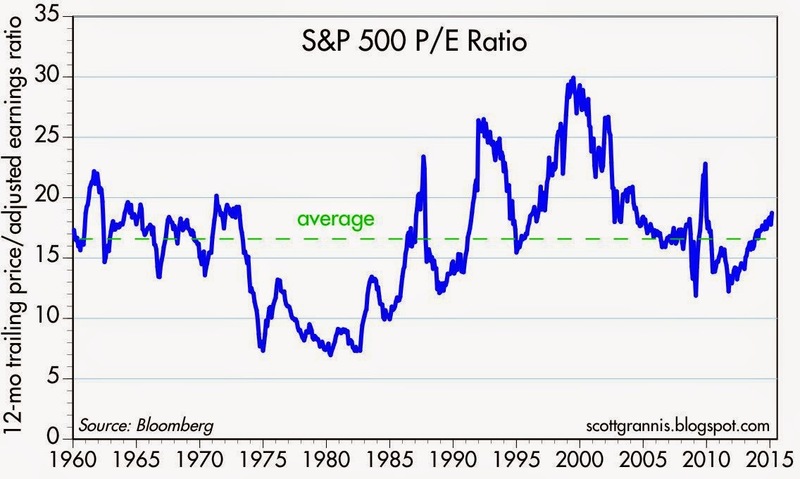 Blodget's chart uses Shiller's P/E ratio: price divided by the average of the last 10 years' worth of earnings. Shiller's P/E ratio is commonly referred to as CAPE, or Cyclically Adjusted Price Earnings.